Many homeowners today are interested in protecting our environment and reducing long-term energy consumption by using Green Building techniques. We are NAHB Certified Green Professionals with the training and experience to reduce your energy use and costs as well as minimize the environmental impact of your building project. 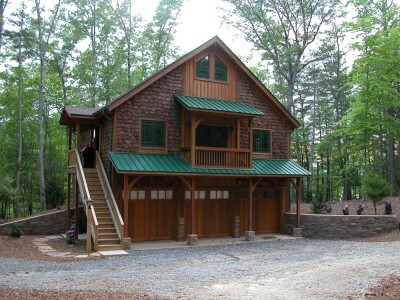 Our company policy is to encourage the use of Green Building practices in all of our custom homes. We are dedicated to providing our clients with product options that take as little as possible from the environment both by using local resources and environmentally friendly products. It has been gratifying for us to continue learning about many of the superior Building Science Ideas that increase a home's efficiency, longevity and increase our Owners' satisfaction with their home. New Building Sciences, Appalachian State University, and Western North Carolina Green Building Council are always striving to find ways to improve a home's efficiency and air quality. As NAHB Certified Green Professionals, we have the experience, knowledge and resources to advise our clients on how to meet their energy consumption and sustainable green goals. Whether you are building a new project or remodeling or restoring an older home, we are ready and qualified to help. To be considered “green," a home must meet requirements that include everything from window selection and installation detail to energy-efficient HVAC systems, framing, siding and trim sealing requirements, controlled venting, insulation requirements and much more. In the process of meeting “Green Building” requirements, a Third Party verification organization can be engaged to provide a detailed list of requirements and a follow-up inspection service that provides an “Energy Star” rating. In addition, there is third party verification for a rating as an “NC Healthy Built Home,” in which low VOC paints and other interior finish features are utilized. Hearthstone, as a building partner, uses fast-growth pine for their Log and Timber Frame packages. The timbers we use are primarily grown in Eastern Tennessee and Western North Carolina, within 100 miles of Hearthstone’s manufacturing facility. The SIP panels we use in our Timber Frame and Timber Trace Homes, are highly energy-efficient, saving significantly on heating and cooling use. We have many resources for reclaimed and antique lumber. The use of this wood for flooring, trim and cabinetry not only preserves trees, but also add a great deal of rustic charm to your home. We encourage the use of High Performance windows and energy-efficient heating and cooling systems. We recycle on our job sites. Our Project Managers work to reduce job site waste. We recycle not only employee-generated waste, such as drink cans, but also left-over job site materials. On remodel projects, we aim for less waste as well. Any materials that are removed, yet usable are donated to Habitat For Humanity’s Re-Store here in Boone. Select the site to reduce environmental impact. Design the site to conserve existing landscape and natural resources. Design appropriate storm water management and water harvesting. Consider building orientation and landscaping for passive solar design. Design for passive cooling (basements, fans, cross-ventilation). Design appropriate roof overhangs and covered entryways. Use pre-cut or pre-assembled building components. Reuse salvaged and/or recycled materials when possible. Use Forest Stewardship Council (FSC) or other 3rd party certified wood, where possible. Sort and recycle on-site building materials. Size heating and cooling system appropriately. Keep ductwork out of exterior walls and within the conditioned space. Consider using highly efficient Structural Insulated Panels (SIPs). Insulate and caulk or foam to prevent heat loss. Use Energy Star appliances and light fixtures as well as CFL or LED bulbs. Consider solar water heating and/or solar electric power (photovoltaic). Use low-flow water fixtures and toilets. Collect rainwater for reuse on landscaping. Consider irrigation controls for landscaping. Consider greywater reuse from sinks and showers where feasible. Check with licensed building professionals. Ensure tight seals between garage and living area. Design for isolated mechanical room. Provide mechanical ventilation and/or humidification controls. Consider heat recovery ventilators or energy recovery ventilators. Use timed exhaust fans for high moisture areas. Install direct-vent or sealed-combustion gas fireplaces. Use low-VOC paints, finishes and wallpapers. Use low-formaldehyde plywood and fiberboard. We recently installed Solar Seam panels on this remodeled home in Boone, NC. The wiring runs through the top of the panel and is hidden along the ridge. The panels are barely noticeable in the finished product. To read more about this solar technology, click here.